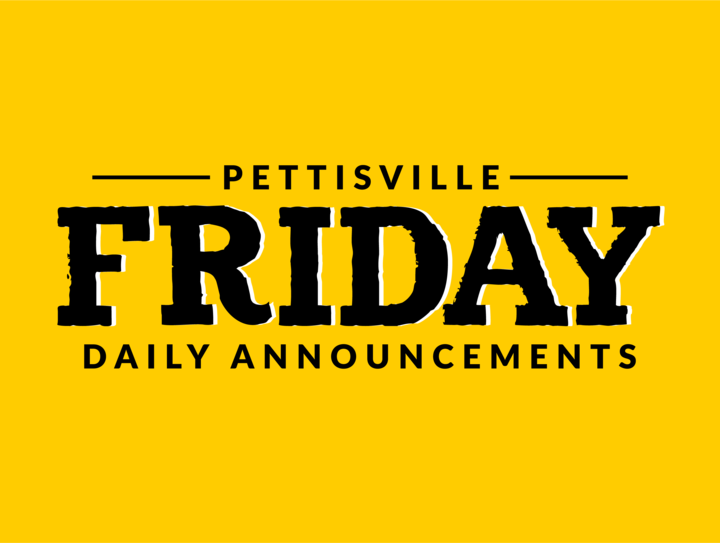 Friday, Feb. 24, 2017 - Seniors: Pettisville School Foundation Scholarship applications are due today. The 5th Module of STEM begins today. All students will first meet in Mrs. Meller’s room after school and from there go to their session meeting locations. Coding, Science of Art, and Water/Soil Quality are the sessions being offered for this module. Tonight’s rehearsal for The King and I has been cancelled and moved to tomorrow afternoon as per the following schedule: 1:00-3:00 Ballet ; 3:00-3:30 Anna and fan dancer; 3:30-4:30 Act 2 minus the ballet. The Toledo Symphony will be performing a concert at Sauder Village’s Founder’s Hall at 7:30pm on Thursday, March 9. Tickets are provided free of charge for any Pettisville student. See Mr. Beck for more information if you are interested. Pre-sale tickets for the boys’ sectional semi-final game are on sale in the office. The tickets will also be on sale tonight in the cafeteria at 7:30pm after the Mini-bird Jamboree. Pre-sale ticket prices are $6 for adults and $4 for students. All tickets at the door are $6. Three days of spirit week, and here are the standings: Seniors – 252; 7th grade – 206; 8th grade – 190; Juniors – 169; Sophomores – 158; Freshman – 146. The winning class earns an ice cream treat next Monday. Final results will be later today. Attention grades 7-12: There will be a track meeting for students and parents on Monday, Feb. 27 at 6:30 in the study hall. If you cannot attend, see Coach Wagner prior to the meeting. Activity Period today will be for NHS & FCCLA. NHS will meet in Mr. Bracken’s room and FCCLA will meet in Mrs. Bacon’s room. All other students should report to homeroom. Mr. Bracken’s homeroom should report to the Ag room for Activity Period. The boys’ basketball teams will travel to North Central High School tonight for the final regular season games with the JV game starting at 6:00 PM. The girls’ basketball team will take on Ayersville in the sectional final on Saturday at Bryan High School starting at 6:15pm. Doors open at 5:15pm. Good luck to all of our teams. Pre-sale tickets are on sale in the office for the boys’ sectional semi-final at Swanton High School on Tuesday, February 28. Pre-sale ticket prices are $6 for adults and $4 for students. All tickets at the door are $6. Thursday, Feb. 23, 2017 - Great job to the 6th, 7th and 8th graders! We have collected $4070.50 for your class fundraiser so far. If you turned in orders, you may pick up your prizes in the office. Tomorrow will be the LAST collection day for the fundraiser. Keep up the good work! Seniors: Pettisville School Foundation Scholarship applications are due this Friday, Feb. 24th. Congratulations to Dominic Heising, Levi Myers, Andrew Hulbert, and Lyla Heising for their 2nd place team finish at the MathCounts competition held yesterday. In individual competition, Dominic placed 3rd and Levi placed 1st. They all earned a trip to the state competition that will be held on March 11. A reminder to all students doing science research projects! All forms for regional and district science fairs are due by the end of the day to Mrs. Meller. The 5th Module of STEM begins tomorrow. All students will first meet in Mrs. Meller’s room after school and then go to their session meeting locations. Coding, Science of Art, and Water/Soil Quality are the sessions being offered for this module. Congratulations to Gretchen Lee, Jordan Skates, and Jacob Dennis who were selected as paper presenters at the 2017 Ohio Junior Sciences and Humanities Symposium next month. All girls in grades 8-11 interested in playing volleyball next school year: There will be a meeting at lunch today in the study hall. If you cannot attend, please see one of the coaches to let them know. Sophomores: Tonight is the sophomore class supper. Please check the sheets posted on Mr. Bracken and Mrs. Nafziger’s classroom doors to verify the times that you and your parents have signed up to work. Everyone is invited to join us tonight for the Sophomore Supper. We will be serving from 5:00-7:00pm. Wednesday, Feb. 22, 2017 - Today is the second collection day for the magazine, cookie dough and tumbler fundraiser! Orders will be collected right after announcements. Everyone is invited to the Sophomore Supper this Thursday evening. We will be serving dinner from 5-7pm. Come and support the sophomore class. Pre-sale tickets will go on sale today through next Tuesday for the boys’ sectional semi-final game at Swanton High School on Tuesday, February 28. Pre-sale ticket prices are $6 for adults and $4 for students. All tickets at the door are $6. Fans are encouraged to purchase pre-sale tickets since the schools receive a portion of the pre-sale ticket sales. Tuesday, Feb. 21, 2017 - This is national FFA week. There are over 649,500 FFA members across 50 states, Puerto Rico and the Virgin Islands. In Ohio, we have over 25,000 members and here at Pettisville we have 59 members. FFA promotes premier leadership, personal growth and career success through agriculture education in support of our country's number one industry, agriculture. Tomorrow is the second collection day for the magazine, cookie dough and tumbler fundraiser! Tomorrow will be the second day of spirit week. The theme will be occupation. Come dressed up as any job you want. Results of the 2017 local Science Fair were as follows. Receiving Excellent Ratings were: Heath Waidelich, Josh Bock, Dalton Myers, Luke Young, Madeline Shumaker, Ben Morris, Dominic Heising. Superior Ratings went to: Gretchen Lee, Jordan Skates, Matt Rupp, Aaron Rupp, Jacob Dennis, Jessie McWatters, Tommy McWatters, Baden Skates, Kenzi Rivera. Students will be preparing their projects for competition in March at regionals, districts, and the BGSU symposium. The Pettisville Girls basketball team will play in the sectional final on Saturday, February 25th, at Bryan High School in the first game of the evening starting at 6:15pm. There will be no presale tickets for the girls’ sectional final. Ticket prices are $6 for adults and $4 for students at the door. One ticket is good for both games. This game will be played at the new Bryan High School. Directions are available on dynaCal. Pre-sale tickets for the boys’ sectional semi-final game at Swanton High School on Tuesday, February 28 will be on sale starting tomorrow, Wednesday, February 22in the office from 8:00-4:00. Pre-sale ticket prices are $6 for adults and $4 for students. All tickets at the door are $6. Fans are encouraged to purchase pre-sale tickets since the schools receive a portion of the pre-sale ticket sales.